Wow. Where to begin with this thing. 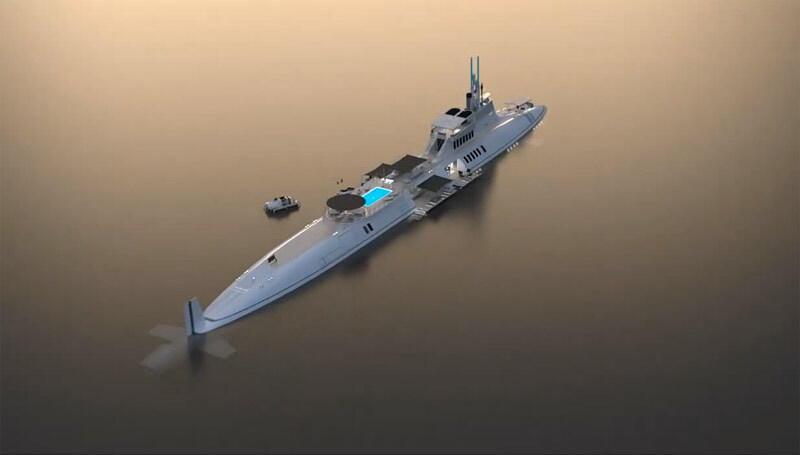 Well it's called the MIGALOO and was designed by the Austrian naval architect firm motion code: blue - who have previously worked on a number of luxury yachts and super yachts in the USA, Europe and Asia. So this isn't just someone's pipe dream. It really could get built. 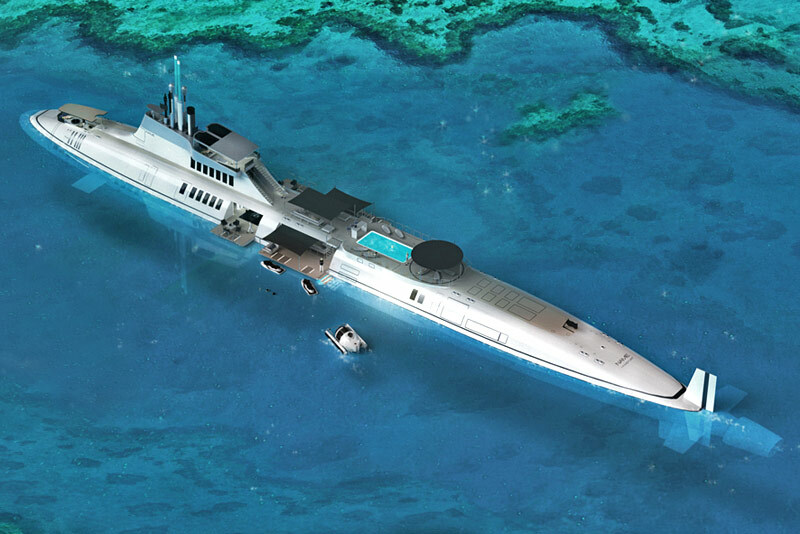 It�s a 115 meter long submarine which has all the amenities you'd expect to find onboard a large luxury yacht; pool, gym, luxurious owner's suite and guest quarters, salon, sunbathing areas, dining spaces, cinema, games room and crew quarters. But at the same time it can dive to depths of 240 metres and travel completely out of sight of prying eyes and the paparazzi. 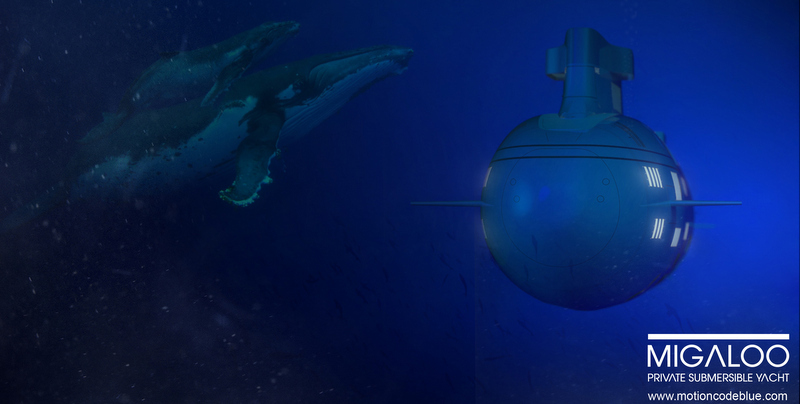 In order to keep the build relativley straight forward, motion code: blue aren't trying to reinvent the submarine. Well, they are a bit. But for the most part they're sticking with a tried and tested submarine hull, and just retrofitting it with high-grade luxury appointments. 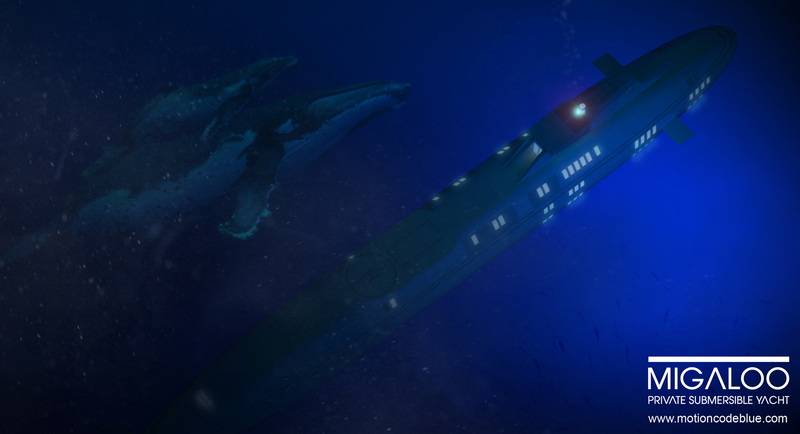 One of the areas motion code: blue have tweaked the design of the original sub is in the conning tower. Here the designers have made it longer and wider to allow more light into the bowels of the vessel. A staircase and elevator take you down to the subs lower decks. The foredeck is fully dedicated to the owner's two-level private suite, hosting a full-beam lounge and bar. On decks 2 and 3 there are 8 VIP suites. While deck 4 houses the crew quarters - who have their own mess and gym as well as the laundry facilities. The hull and tower are fitted with specially designed high-pressure windows which offer views of the briny deep. Lights fitted around the windows help illuminate the depths. 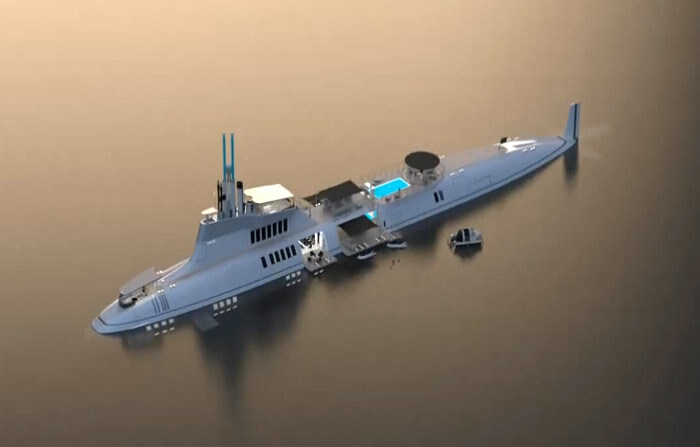 Up top, the MIGALOO luxury submarine has numerous fold-away sun shades and sea-level decks for outside living. Which will probably provide a welcome break from the confines of the sub's enclosed interior. There is also storage space for the sub�s tenders and toys - like jetskis and dinghies. The sub gets its name from the only albino humpback whale known to exist. The animal lives off the east coast of Australia, and the word "Migaloo" is an aborigninal Australian word meaning "white fella". It's fitting then that the sub is also painted in brilliant white. And it's the only one of its kind too.